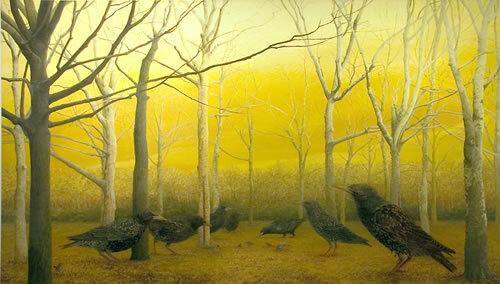 Artist's talk with Holly Sears at the gallery Sunday April 1, 2007 at 4 pm. 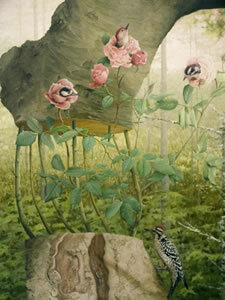 In the polished and highly refined paintings of Holly Sears, we are taken on a nature walk conducted by a surrealist. 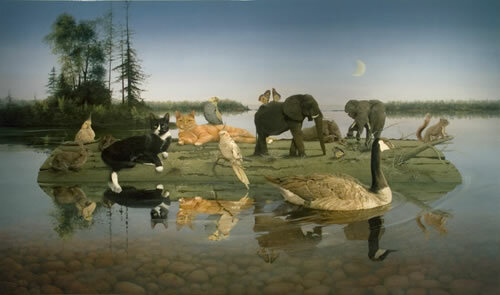 It is a peaceable kingdom if a strange one in which birds nestle in roses, trees dance, cats take on elephantine proportions, and elephants take on feline ones. The sense of these paintings is the sort of gentle nonsense well recognized by children. 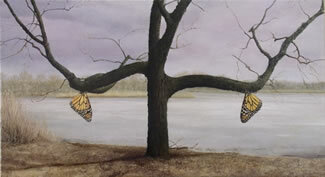 They encourage the viewer to take a leap to the other side, where things aren't always as they seem. 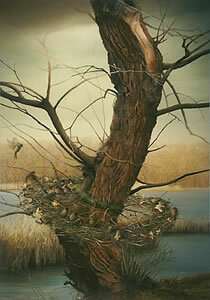 Sears' gentle brand of tightly focused surrealism is deeply rooted in careful and informed observation of the natural world and her superb technique provokes a seamless recognition of the absolute possibility of her images. In her work there is a delicious blending of the deeply magical with the cooly observant eye of the natural scientist. The critic Dominique Nahas has written that, "So deftly and defiantly does Sears intermingle the fantastic and the factual in her work that the images she comes up with seem not so much to be descriptions as they are transcriptions of the marvelous. We are in an unpopulated world where dream-logic pervades: the contrived and the spontaneous, the prosaic and the miraculous, the arbitrary and the designed co-exist in a state of suspension". 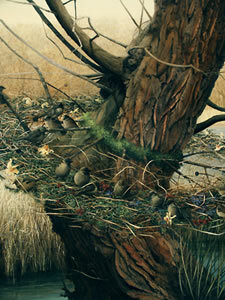 In 'Tutu' a group of sparrows playfully embellish the trunk of their home tree with a skirt woven of fibers, grasses, and flowers urging it to sway. The mixed animal crew of 'Big Water' drift on still waters through a calm moonlit evening suggesting a group of pilgrims or explorers off in search of new worlds and bringing to mind the 19th century paintings of rivermen by George Caleb Bingham. Indeed, American landscape painting of the 19th century with its clear eyed intimations of the sublime and sense of discovery are an important touchstone for Sears who finds lodged in nature a similar awe and wonder. Sears' paintings, though, have more to do with the intimate corners of the imagination than with grand vistas, often locating and focusing upon the minute textures or odd details within the larger frame. Anyone who has spent enough time in nature knows that the natural world is full of mysteries. Sears takes this knowledge one step further into the realm of dreams. 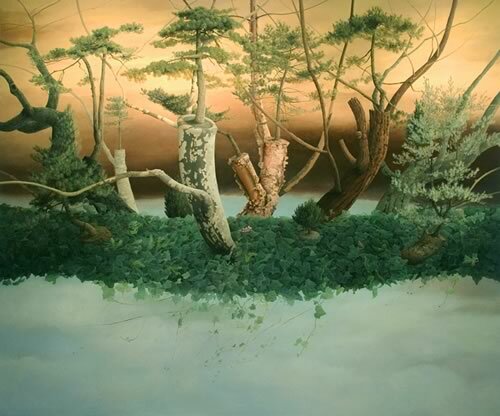 "Big Water" oil on linen 45" x 76"
"Grove" oil on linen 40" x 70"
"Ivy" oil on linen 60" x 72"
"Ice" oil on linen 15" x 27"